Bow Butts is an open piece of grassy parkland lying behind the Royal and Ancient Golf Club in St Andrews. The name Bow Butts comes from the ancient requirement for all able bodied men to be able to bear arms in time of war, the weapon of choice being bow and arrow. Bow Butts was the archery range for St. Andrews. 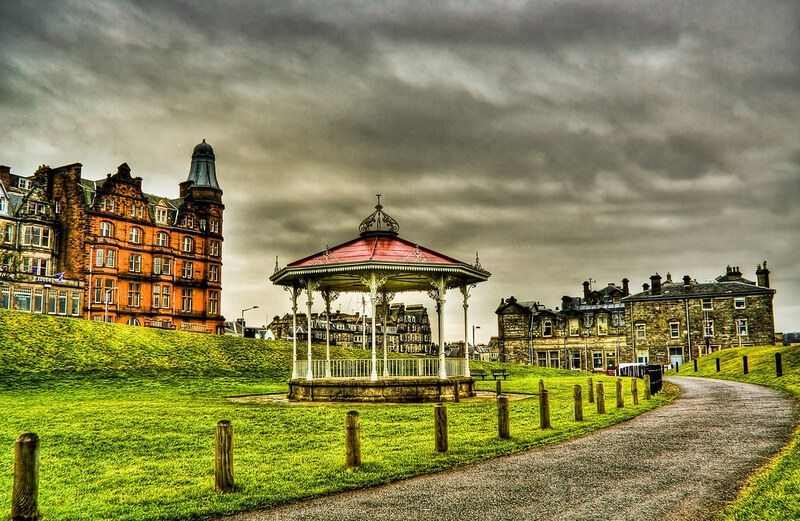 In the centre of the image you can see the St Andrews Band Stand, not used as much as it once was, but live music is played here on occasions during the summer months. To the right you can see the rear of the Royal and Ancient Golf Clubhouse sitting proudly infront of the 1st tee of the Old Course. On the left, the red building is Hamilton Hall, once the Grand Hotel, then a student residence it has sat empty for a few years as the people behind “The Grand” venture ran out of money. Recently purchased by the Kohler Company, (yes the US kitchen people), who also own the Old Course Hotel, the town is now waiting to see what they have in store of this famous St Andrews landmark. This entry was posted in Golf, Scotland, St Andrews and tagged fife, Golf, hdr, Hotel, Scotland, scottish, skreid, St Andrews, town, urban. Bookmark the permalink.